A quick overview of JPA Joined Subclass inheritance strategy. The tables corresponding to subclasses do not contain the field from the superclass, except for the @Id fields which are mapped to the primary key(s) of each table. The primary key column(s) of the subclass table serves as a foreign key to the primary key of the superclass table. 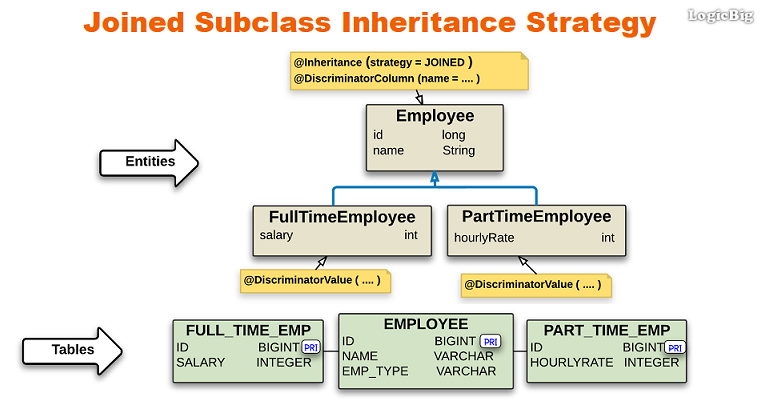 The annotation @Inheritance is used on the root entity class with strategy = InheritanceType.JOINED. @DiscriminatorColumn is used on the root entity class to specify the discriminator column attributes. Discriminator is a way to differentiate rows belonging to different subclasses in the root table. @DiscriminatorValue is used on each persistable subclass to specify a unique discriminator value. This strategy has the disadvantage of using one or more join queries to instantiate instances of a subclass. In deep class hierarchies, this may lead to unacceptable performance hit.